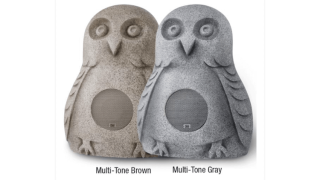 HOOT speakers from OWI The What: OWI has introduced its “HOOT” Rock Indoor/Outdoor Speaker. The What Else: HOOT speakers are designed in the colors and shape of an owl. Every hand-painted HOOT speaker is made in the USA of glass fiber reinforced concrete that is cured for 25 days. They feature a water-resistant BSK speaker, and are available in multi-tone gray or multi-tone brown. Measuring 15 inches high, 11.5 inches wide, and 7 inches deep, HOOT speakers are UV-resistant, bug, puppy, and lawnmower proof, and can withstand hundreds of pounds of standing weight. For added security, they have a built-in security cable attachment ring. HOOT speakers carry a five-year warranty and sound just as great as they look. HOOT rock speakers are available in low-impedance 4 ohms max 30 watts or commercial high-impedance 25V/70V/10-watt and 70V/25-watt models. The Bottom Line: Designed to distribute audio for background music in outdoor areas like sports bars, patios, gardens, atriums, spas, and other applications, the new HOOT speakers are designed to provide an easy way to produce quality audio with ease of installation.